I have been using a few of The Ordinary products for a couple of weeks now, so I thought would share my thoughts so far. To begin, I should say that I am not a beauty blogger, so I don’t have any of the fancy terminology or any technical beauty knowledge, this is just my humble (and honest!) opinion. I have not been asked to write this review and paid for these products myself. It’s probably also helpful to know what my skin type is. I am a few months off 40 and I’m told I have good skin for my age. If that’s true (for I see plenty of age spots and fine lines when I look in the mirror) then I put it down to never putting my face in the sun. (Factor 50 and a large hat ALWAYS) I have also never smoked, don’t drink that much and pay pay quite a lot of attention to my skin. I DON’T drink tons of water, go for regular facials or take any vitamin supplements. My skin is usually dehydrated and has the odd breakout, but on the whole it is ‘normal to combination’. 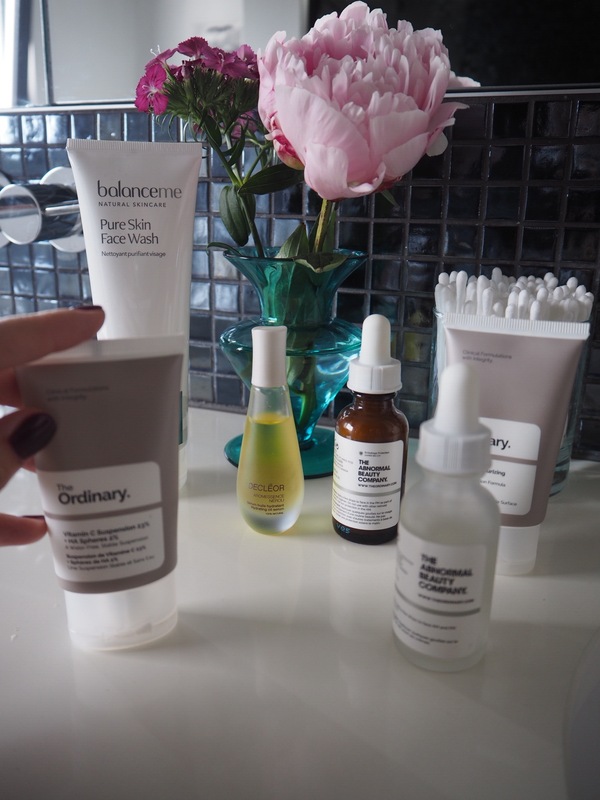 If you haven’t heard of the Ordinary Products, there is a definitive guide on the Victoria Health Website (which you can read here), but it is essentially a no-nonsense, affordable collection of skin treatments. They are free of parabens, sulphates, mineral oil, methylchloroisothiazolinone, methylisothiazolinone, animal oils, benzalkonium chloride, coal tar dyes, formaldehyde, mercury, oxybenzone and are NOT tested on animals. They won ‘Best Anti-Ageing Brand’ at this year’s The Sunday Times Style Beauty Awards, which is an amazing achievement for such a new brand. I am going to start with my favourite product, the Hyaluronic Acid, which I will definitely be buying again. It is a clear serum which comes in a little bottle with a dropper. When I first started using this, I avoided using it too near my eyes, thinking that it contained some kind of acid because of it’s name. 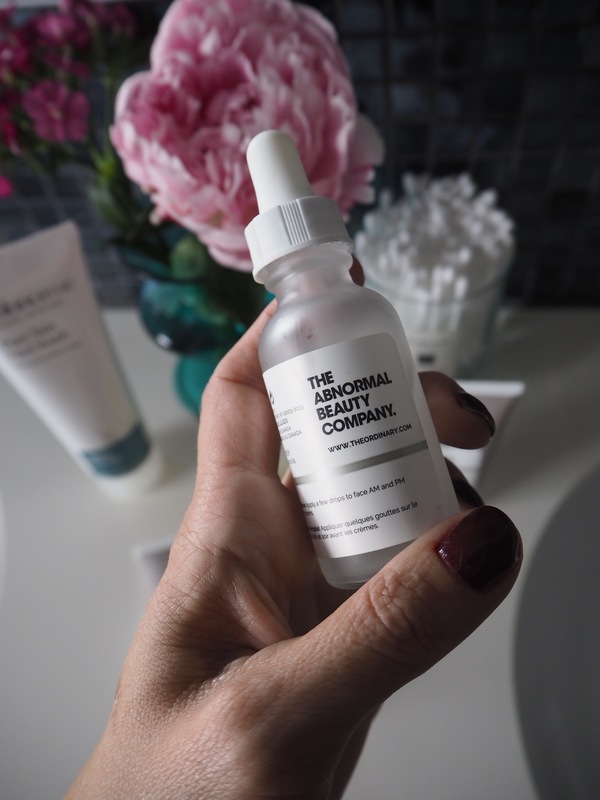 (Despite loving lotions and potions I am a complete beauty novice especially when it comes to the scientific side of things) Hyluronic Acid is a hydrating serum which not only tightens but also improves surface hydration. I like to think of it as a good drink of water for my skin, so it’s perfect for under the eyes. It’s ever so slightly sticky but that doesn’t last long and I always follow with moisturiser so any stickiness disappears. Retinol is said to be the Anti-Ageing superstar, promoting cell turnover, stimulating collagen production and improving every aspect of age related skin concerns. I have started using this, but only 2/3 times a week so it’s far too early to notice any real results. I am a little nervous after reading a few reviews, which said that it caused some redness, irritation and flaking. This is supposed to happen, unless you are a long time user of retinol or have extremely resilient skin, but I wanted to approach this one with caution. Especially since I am using a lot of these products for the first time. If you are using this product, be careful not to apply it too close to the eye area and the most important thing to remember is to use a high SPF if you are going anywhere near the sun as your skin will be more prone to sunburn. The product comes in a dropper bottle and looks like Amoxicillin (anyone who has children and lives in the UK, will probably know what this is!) It is a slightly yellow and chalky serum that feels cool and watery on the skin. Best to use this after a double cleanse and follow with moisturiser. Did you know that you should always wash your face after using Micellar water? I didn’t, but I watched Nadine Baggot’s vlog on this last night and it makes complete sense…I shall be rinsing it off with water tonight. It’s too early to say whether this is working but I have high hopes. The other star product when it comes to anti-aeging is Vitamin C. It’s an anti-oxidant that boosts collagen production, protects the skin from pollution and improves skin tone and brightness. 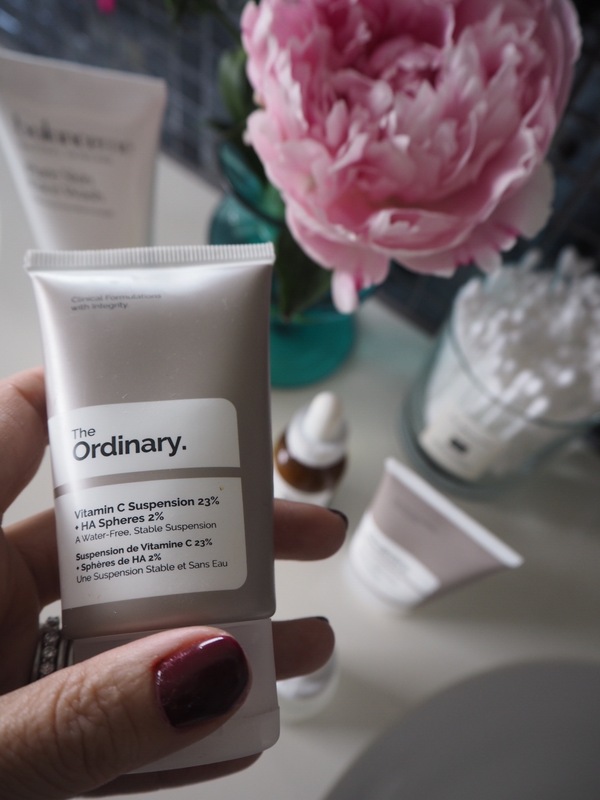 The Ordinary have four products with Vitamin C but I had heard good things about this one, so I thought I would try it. I have since read up about it some more and it gets very mixed reviews which are pretty much split 50/50. It feels like an exfoliant on my skin, except that you don’t rinse it off. (If you have used Dermalogica products before, it reminds me of their daily microfoliant) I find it a little greasy, tingly and itchy on my skin and after nearly 10 days of use, this seems to be getting worse, not better. I am not sure if I should take this as a sign that it is doing it’s job (it does say on the packaging that you will experience tingling) but it may be that I need to use a slightly lower dose of Vitamin C until my skin is used to it. (This is high at 23% ) I will continue using it as the itching isn’t unbearable and I have got used to the texture. This is the product that I thought I would like the least, and I LOVE it. For five pounds, it is an amazing moisturiser packed full of amino acids (I have no idea what that even means but it sounds good) and leaves your skin feeling hydrated but not greasy. It’s very light and I love the way it sinks into my skin. I will definitely be buying this again. So those are the four products that I have bought and used so far. What I love about them is that they don’t break the bank if you just want to try them out, unlike some other skincare brands which can end up being a complete waste of money if they don’t work for you. I have bought all of my products from ASOS, as I paid for Premier Delivery for a year, so they get delivered free, the next day. The full range can be found at Victoria Health. 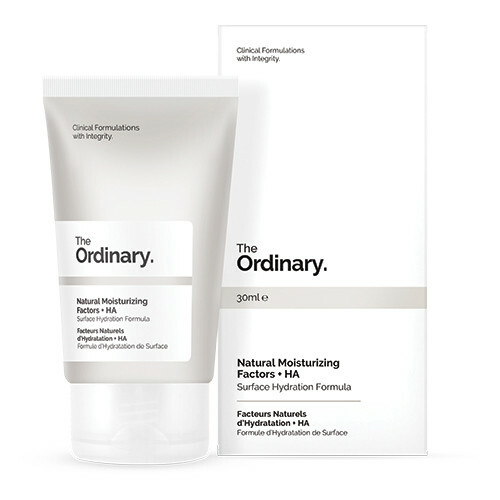 Are you a fan of The Ordinary? Do you have any favourite products? If so, I would love to hear from you. Sali Hughes raved about their foundation yesterday in the Guardian. I must give this brand a go – good to get your insight! Thanks Chloe. Keen to try some Ordinary products I’ve heard great reports but just been given some Samuel Jordan & Jane Scriver products to try. Loving them so far but I have to be careful as I have a tendency to break out. Bloody 46 and still getting breakouts. I’ve got a hideous spot on my cheek at the moment… I’m prone too. 🙈 so far so good with the ordinary, you can’t beat it for value for money! Bought the moisturiser on your recommendation and love it. 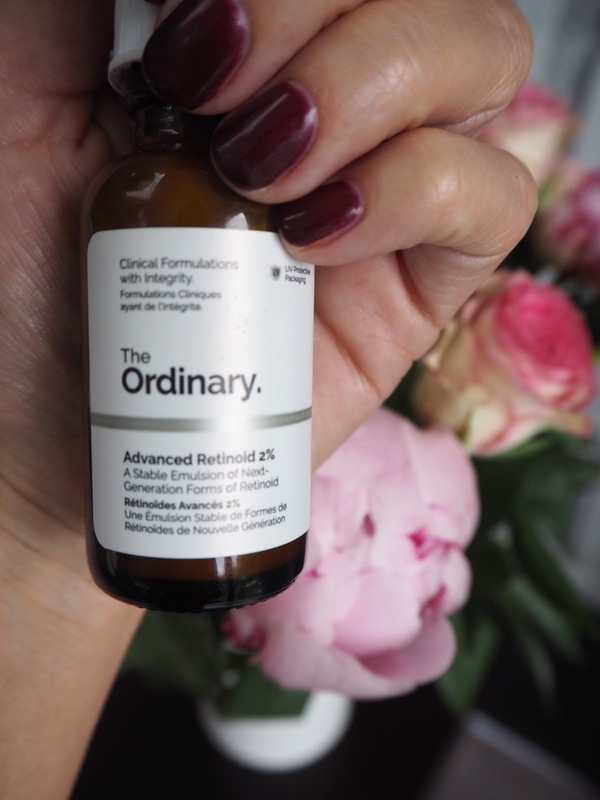 I’m considering the 2% retinoid but was wondering if you had seen a difference or had any irritation yet?